Super special and chocolaty cupcakes can be yours. 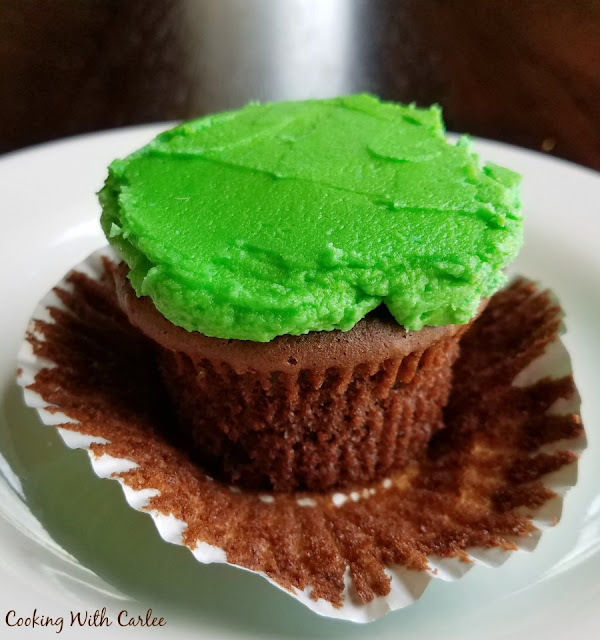 This doctored up cake mix cupcake recipe is a perfect way to get great results without too much effort! 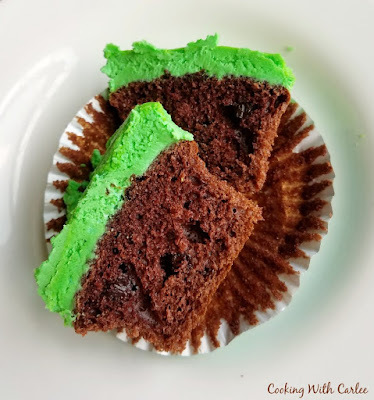 These semi-homemade chocolate cupcakes start with a cake mix, making them super simple to make. The added ingredients make them feel special and more homemade. They are perfect for when you are short on time but still want to go that extra step. They are fluffy, chocolaty and oh so good. A healthy dollop of your favorite frosting and they are ready to go! Little Dude's birthday party is one of my favorite events to throw each year. Mostly because he gets so excited about everything. Last year, we had his train party on Sunday because my grandparents from Florida were coming into town that day and we wanted them to be able to be a part of such a special occasion. It was nice to have Friday night, all day Saturday and Sunday morning to bake everything. So the cake was from scratch. This year, however it made more sense to have his party on Saturday. It makes getting everything cleaned up and ready to hit the work week easier, but it crams prep a bit. As much as I would love to take a day off work for every party, that wouldn't leave much time to take an actual vacation. So I decided I could give myself a little bit of a break and use a cake mix to get the cupcakes done a little easier. Honestly, making them from scratch isn't that difficult. However, sometimes when you are staring down the barrel of a lot of items on the menu and a compressed timeline, it is worth just not having to mess with it. While following the instructions from the box gives you some pretty decent cupcakes, I just couldn't not doctor them up a bit. I mean, Little Dude's birthday only comes around once a year and he deserves something special! As I was adding ingredients, I figured I might be diluting the chocolate flavor a bit. I knew I wanted to give that a boost as well. I was worried adding too much cocoa powder might make them a bit too bitter. So I went with mini chocolate chips. I was hoping they would kind of melt away into the cupcakes and it worked just as I had planned! These would be delicious with chocolate sweetened condensed milk frosting, chocolate buttercream, or cream cheese frosting. However, I needed to be able to have colors for the Grinch cupcake cake and I wanted to be able to pipe it nicely (and have it hold up decently in the warm weather!) So I went with a version of crusting buttercream I have been working on that forms a crust but allows you to do that without it being quite so sweet. I hope to share that soon! Preheat oven to 325 F and place cupcake liners in cupcake tins. Whisk together the cake mix, flour, cocoa powder, sugar and salt. Add wet ingredients and mix on medium speed for two minutes. Bake 18-20 minutes or until the tops spring back when lightly touched with a finger or a toothpick comes out clean. So Spring Sensational...that frosting! Doctored Up works for me just fine! Happy Tuesday! We all need a little break sometimes - and cake mixes are great! 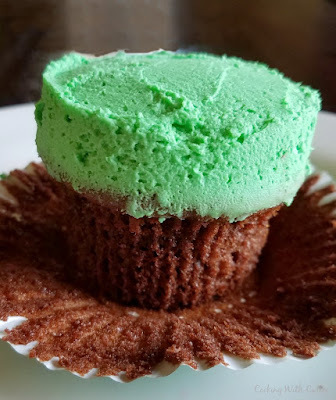 I love the cupcakes with the green frosting. Hi Carlee, as much as I like cooking from scratch sometimes it just makes sense not to. We aren't super human, nor do we need to be (well, not all the time!) and if little man was happy, that was the main thing. I must check out out your crusting buttercream recipe! With my new job, I am really appreciating semi-homemade recipes more and more! These cupcakes sound great! Your cupcakes look great and so easy, I love easy! Hope you are having a great weekend and thanks so much for sharing with us at Full Plate Thursday! I love that you call using a box mix semi-homemade!!! For the record, I have nothing against a box mix...canned frosting though...that one makes me cringe every time!!! I love using cake mixes when I bake cakes or cupcakes. Your doctored up cupcakes sound so delicious! I featured them on this week's Whimsical Wednesday Link Party. Have a wonderful week and thanks for linking up!